Angler Angus James had just caught a perch in Australia - but when he opened the fish's mouth he was in for a slimy surprise. NineMSN reports inside the fish's mouth there was a FROG that looked pretty thankful to be alive! James says he was shocked. Check out the pic from Reddit below. NBC anchors, who apparently really liked James's name, said he didn't realize it was a frog at first. "Angus James, gotta love that name, says at first he thought it was some kind of grass, but then it blinked." "It was his last supper." 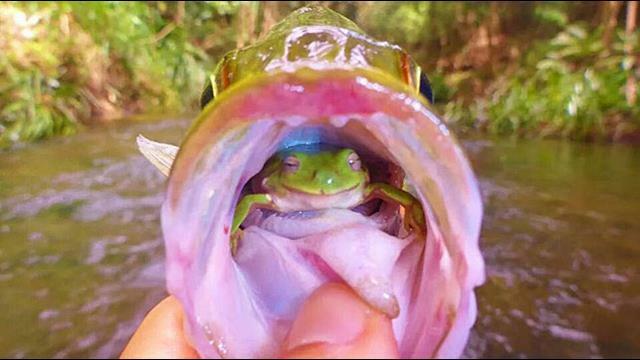 News Limited spoke with James, who told the publication he was pulling the lure out of the jungle fish's mouth when he noticed the amphibian. Right after he took the photo, the frog seized its chance to jump away. James also released the fish back into the water after his prize-worthy photo was snapped. Rhys Moult: "Like a turducken?" We guess this would be more like a Frogerch? Get it? Frog ... perch? Okay, we got nothin'.